After completing the Australia Awards Short Course on Women in Executive Leadership Development in December 2017, senior Government officials from Bhutan planned to counter gender stereotypes and break down barriers to women’s participation as decision-makers in the workforce. The Short Course, delivered by the University of Queensland (UQ), was designed to provide practical ideas, tools and approaches to help senior level executives combat challenges faced by women in leadership roles. Dallas Dowsett, Deputy Director of UQ International Development, said the eleven female and five male officials would use the knowledge and skills gained from the course to develop and implement a Return to Work Plan appropriate to their work context in Bhutan. “The course is tailored to ensure content addresses the specific challenges women executives face in the Bhutan public and private sectors,” said Ms Dowsett. 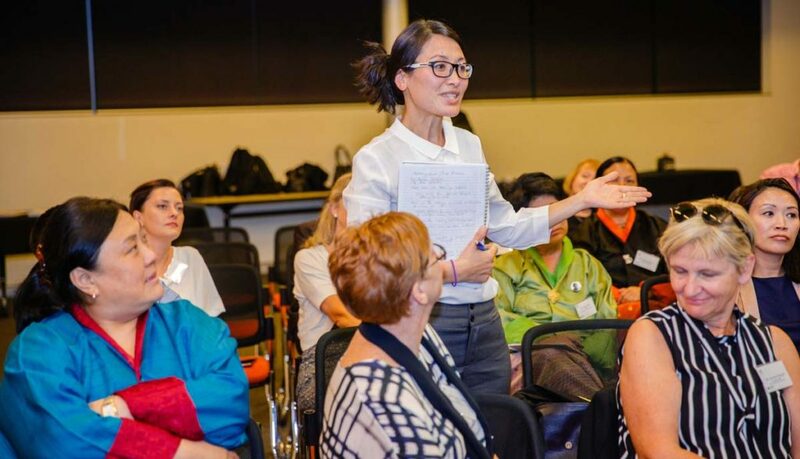 Recipient Tashi Yangzome Dorji participating in discussions at the Australia Awards Women in Executive Leadership Development Short Course. Mr Chimi Dorji, Deputy Auditor General of Bhutan’s Royal Audit Authority, believes the course provided him with new insight. “Although leadership can be a natural talent, without training such as this you cannot be effective. This training means that we can apply these qualities and become more self-aware in our decisions, especially in the areas of adaptive challenges and unconscious bias,’ he said. Ms Phuntsho Lhamo, Chief Education Monitoring Officer of the Bhutan Education Monitoring Division, said the course had been hugely beneficial in enabling her to apply techniques that could make small, incremental changes. “For now, I need to create gender balance in my team. Then once I have achieved this, I need to focus on the bigger challenge. I now need to take men on the journey and show how we can collaborate, enrich and come together,” said Ms Lhamo. The third and final component of the course took place in May 2018 in Bhutan.